If you love traditional Bargello quilts with their illusion of curves and flowing waves, but are wary of tedious cutting and the complexity of creating free-form patterns, this new 16-piece Bargello block technique allows you to have fun playing with a collection of blocks to create end possibilities--the more blocks and colors, the more possibilities. 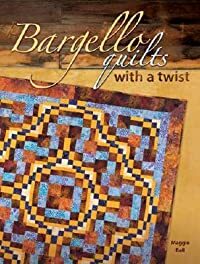 With the newly created block method, "Bargello Quilts with a Twist" allows you to create the look of Bargello with ease. Strips are cut and pieced in sets of four, counter-cut, and joined to complete the blocks. Using the versatile pattern, there are an amazing number of ways to arrange as few as 16 blocks to create exciting and unique patterns.